Is Christina Aguilera actually charging more for plus-size tour merchandise? The controversy began after a fan posted a photo from the first show of Aguilera's new tour. Christina Aguilera came under fire recently after fans were being charged more for plus-size tour merchandise at a recent show. The controversy began after a fan posted a photo from Aguilera's show on Sept. 25 in Hollywood, Florida, which kicked off her "Liberation Tour." The photo sparked several complaints on social media, with some fans accusing the “Fall in Line” singer of unfairly putting a premium on being plus size. “Is Christina really charging extra for XXL and XXXL sized merchandise? Brutal,” one Twitter user wrote. Celebrity gossip blogger Perez Hilton even weighed in, saying he was “upset” by the pricing. He argued that even if the larger shirt sizes might be slightly more expensive to produce, it didn’t justify a $5 price difference. Other fans defended the singer, pointing out that she almost certainly does not personally set the prices of her tour apparel. I can assure you she doesnt set nor know the prices of her tour merch. Chill gurl! She’s an advocate of self love and would never discriminate against anyone. 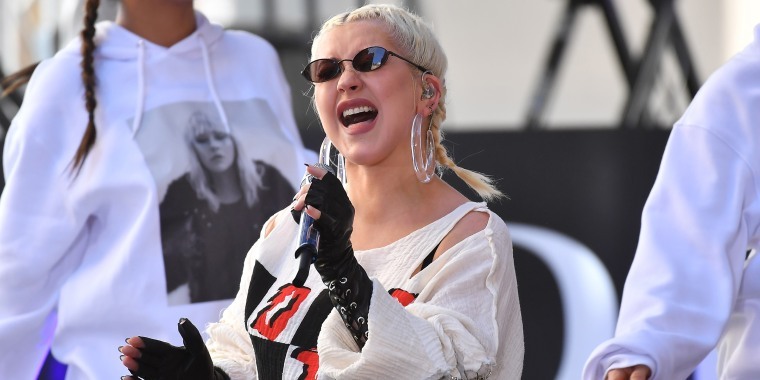 Soon after the photo from her Florida show went viral, Live Nation Merchandise, the company that handles Aguilera’s tour sales, cleared up the controversy. “There was an error in merchandise size pricing at one of the Christina Aguilera shows," the company said in a statement to NBC News. "Christina and her team were not aware of this and the costs have been adjusted appropriately." Prices are also the same across the board for the shirts available on Aguilera’s official website. Aguilera, 37, has been busy traveling the country for her "Liberation Tour," her first tour in more than a decade. “The last time I was on tour I was pregnant with my son,” she told TODAY in June, referring to her 10-year-old son, Max.